Gionee after their Dream D1 and GPad have released budget phone as they should have their smartphones in all the low-range section of Android smartphones. Gionee has been popular with its Dream D1 and now when Karbonn, Micromax and Samsung have launched their mobile phones in the price range near 5,000 INR. So here we have a new phone by Gionee named as P1 at the price of 4,999 INR with the screen size of 3.5 inches, so this phone is going to be short and fat. When compared with Karbonn A3 then it has the smaller screen size. Processor is of 1GHz processor with the architecture Cortex A-9 and the RAM on this phone is 256 MB which is the lowest you can get for a phone with Gingerbread on the board. The internal memory is of 512 MB which is sufficient provided this phone will not be able to handle large number of applications due to low hardware spec and this storage capacity can be increased upto 32GB. 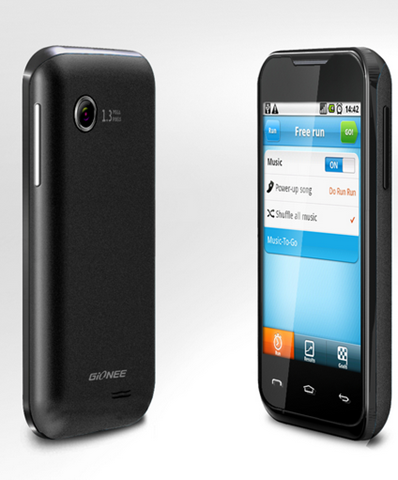 The battery strength of 1500 mAh is sufficient for this phone as it has got a very small screen size. It has got the primary camera support of 2MP which is 3.2MPR in case of Karbonn A-4 and it has also got the support of front camera (this is the thing which I like the most in these low-end phones). Despite the low price they will provide you everything, even though it will not be the best but still you will be able to use it. In Samsung Galaxy Y you cannot use the video chatting applications where as in these phones you can do that. This phone will come with 4GB of external memory card and it will also have 2 cases for phone and protection film. So this also saves the maintenance cost on this phone which again costs around 500 INR from the pocket after buying the phone.